Two weeks ago, one of our colleagues in the faculty was looking for breastmilk to give to her three-week old granddaughter who was in the Neonatal ICU. The mom was unable to produce breastmilk which the baby needed so she can be strong and fight the pneumonia that has afflicted her. I wasn’t sure if they were able to get enough for her though because last week we learned that the little angel succumbed to death. I was unable to produce my own breastmilk too when I gave birth to my daughter so I really envy moms with newborns whose only problem is how to properly store and handle their own breastmilk. When my daughter, Bianca, had cancer last year, it did occur to me that perhaps she wouldn’t have it if I had breastfed her when she was a baby. But then of course that’s more like my guilt talking to me than Science. Anyway, I know the importance of having a good stock of breastmilk and a proper storage kit that would keep it safe until it is ready to be consumed by the baby. I have heard it enough from my mom friends to know that pumping breastmilk is one thing and keeping it from getting spoiled is quite another. My two best buddies recently gave birth and we were just so thrilled when I received a package with Honeysuckle breastmilk bag inside. I just had to share it to them. They have been looking for one that is handy so they can pump and store their breastmilk easily especially when they return back to work. And of course something that is proven safe to use for storing their oh so precious mama milk. We were so glad to know that HoneySuckle® which is 100% tamper-evident, BPA-free, Oxo-biodegradable and recyclable is already available in the market. 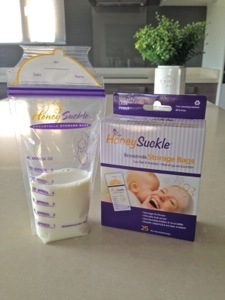 HoneySuckle® is the more enhanced version of the popular reclosable breastmilk bag Lansinoh® which inventor Nossi Taheri created in 2002. 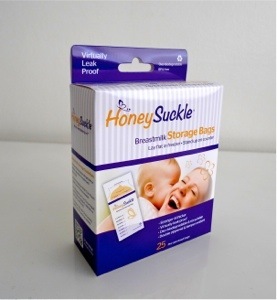 HoneySuckle® as compared to its predecessor, has wider side seals, double zipper and ribbed gusset to protect and prevent breastmilk from leaking during storage. It has a pour spout that would eliminate spills when transferring breastmilk in bottles and an outer write-on tab to help mommies date and organize their breastmilks. It doesn’t take much space as it can lay flat in the freezer and can stand on the counter too when needed. It is the strongest and most economical breastmilk storage bag in the market today. With HoneySuckle® babies need not take alternative food when mom is not around and mommies need not worry about how to save their precious breastmilk after working so hard to pump them. Two less worries for mommies if I may say so. To know more about HoneySuckle®, you may check honeysucklemoms.com. honestly i like your content but background of your website is more likable.